04/27/2019 – LI-DOG Pack Walk™ OWG April 2019 Recently updated ! 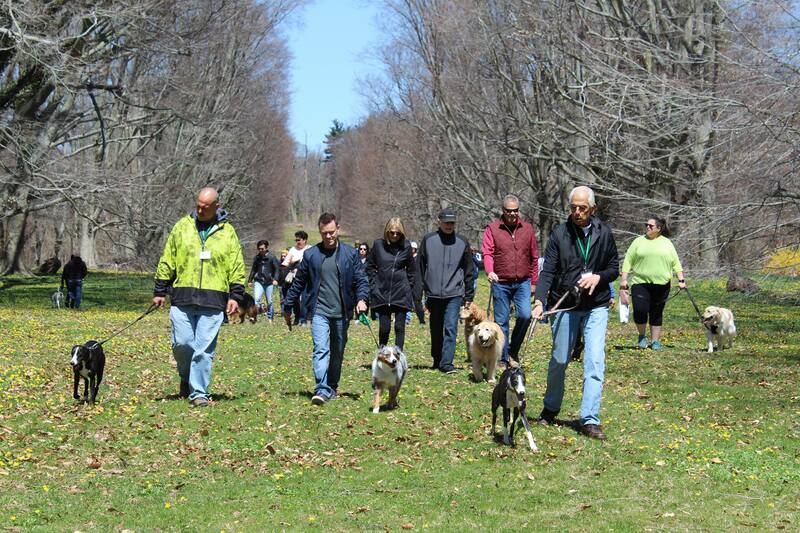 LI-DOG Pack Walk™ at Old Westbury Gardens! LI-DOG cordially invites our canine families to LI-DOG’s Pack Walk™ at Old Westbury Gardens during the Old Westbury Gardens Spring Dog Festival! On Saturday, April 27th at Noon (FREE registration starting at 11 a.m.), please join us for an LI-DOG Pack Walk™ as we spend a delightful hour on a guided tour of the beautiful, English-themed splendor of Old Westbury Gardens. There’ll be plenty of spring’s budding horticultural treasures for our eyes and our fur babies’ noses to enjoy! The Pack Walk™ is almost all on flat ground and there are opportunities to shorten the walk for those who wish to do so. Make sure to bring poop bags–as clean-up is a must!–and bring your camera as there are many beautiful photo opportunities on the grounds. Please no retractable leashes on the Pack Walk as dogs and people can become entangled. Registrants for the LI-DOG Pack Walk™ at Old Westbury Gardens will have the opportunity to donate $5 to LI-DOG for a chance to win a raffle basket of goodies for you and your dog. If you double your donation, you (more than) double your chances to win as a $10 donation gets four tickets! Proceeds support LI-DOG’s work to gain more access to public parks and beaches for Long Island dog owners and their dogs. Make sure to stick around after the Pack Walk and enjoy the Old Westbury Gardens Spring Dog Festival with booths and exhibits from rescues, animal advocacy organizations including LI-DOG, and vendors of doggie goodies and gear. OWG’s Spring Dog Festival runs from 11 a.m. to 4 p.m. on Sat. only. On both Saturday and Sunday, from 10 a.m. until 5 p.m., enjoy Old Westbury Gardens’ Spring Dog-Friendly Weekend when on-leash dogs and their people are invited to enjoy the grounds of the estate. Dogs must be on-leash at all times when visiting the gardens and are not allowed in any buildings on the grounds. OWG admission fees are $12 for adults; $10 for seniors (62 and over) and college students with ID; and $7 for children ages 7-17. OWG members, children 6 and under, and four-legged visitors are free! For more info about Old Westbury Gardens: Email info@oldwestburygardens.org (vendors and rescue groups encouraged to sign-up) or visit oldwestburygardens.org and click on “Spring Calendar” for a wonderful overview of their other spring events and programs. We look forward to seeing you and your dogs at Old Westbury Gardens on Sat., April 27th!